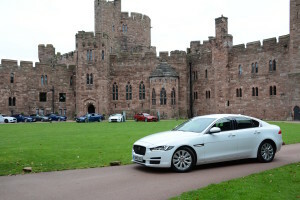 In the premium compact saloon class, the BMW 3 Series seems to have had things all its own way for a long time, however all that has changed with the appearance of the new Jaguar XE. Jaguar hasn’t had a car in the compact premium saloon class for a long time, and we won’t focus on the details of the brand’s last offering. In the meantime the BMW 3 Series has been continuously improved and as a result has gone from strength to strength. This includes in the area that we’re particularly interested in: a car that is great to drive but also efficient. Can Jaguar enter this market and successfully challenge the 3 Series with its first effort? The XE looks like a scaled-down XF for a valid reason – the XF is a good-looking car. 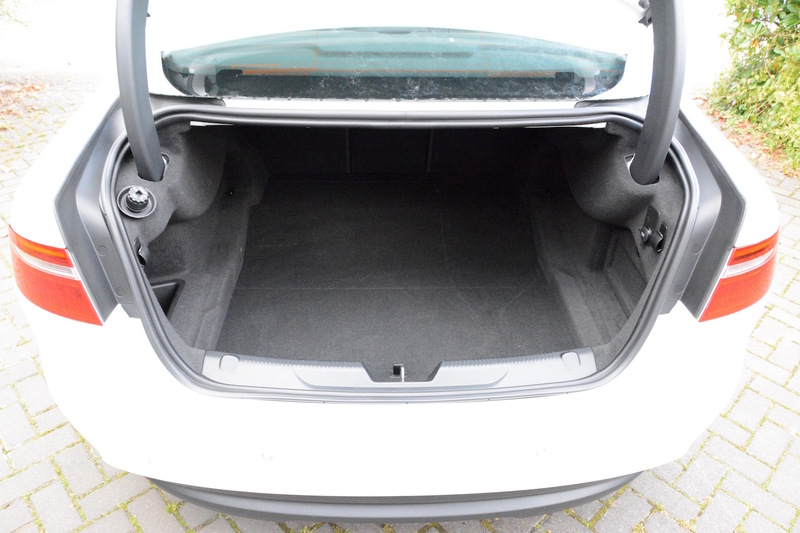 The XE shares the same largely uncluttered lines, but in a more compact and slightly less sleek overall package. As well as looking good, the XE also looks different to the many German rivals on our roads. During our week with the XE, we turned up on a pre-booked weekend at Peckforton Castle hotel in Cheshire. We drove into the castle’s courtyard and what did we stumble upon? 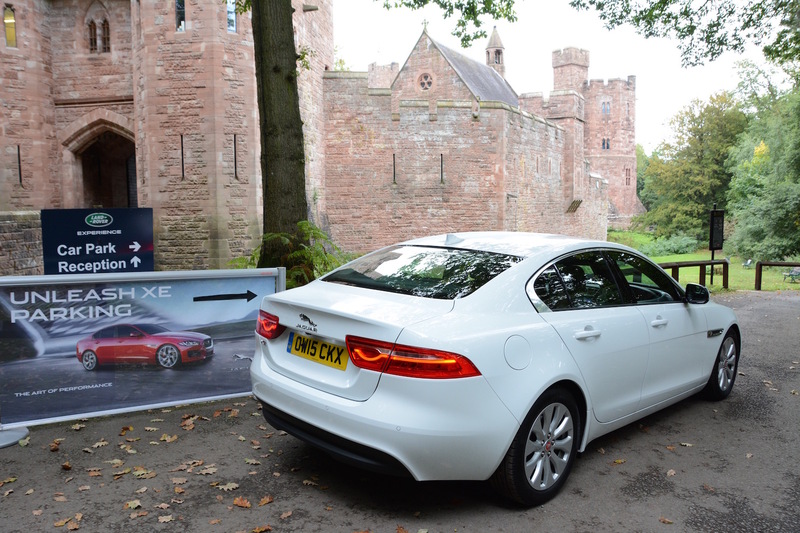 – a Jaguar XE event. After explaining to the event staff that this wasn’t one of their cars, one suspicion was confirmed – like most cars, the Jaguar XE looks much better on a decent set of alloy wheels. All the cars at the event for prospective customers were kitted out with impressive-looking wheels and tyres. However our car had relatively conservative-looking alloys in the interest of low emissions. We imagine that most buyers who have the ability to specify wheels of their choice will go for larger alloys, and sacrifice some relatively small emissions savings. They may well also specify a more exciting colour than white. 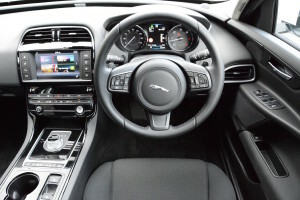 The interior of the XE is pleasant enough, although our car was predominantly black inside – with both matt black plastics and shiny black plastics. It’s a subjective thing, but in our experience, most people are likely to prefer the design, materials and ‘perceived’ quality of an Audi interior. People who like really shiny interiors will no doubt opt for a Mercedes. This test car came with a 2.0-litre ‘i4’ turbodiesel engine, mated to an 8-speed automatic transmission. This is one of Jaguar’s new Ingenium engines, which aims to offer a combination of performance and economy. With 163PS, 380Nm torque, 68.9mpg and 106g/km CO2, the figures are certainly competitive with rivals (although with manual transmission, emissions drop to 99g/km CO2). 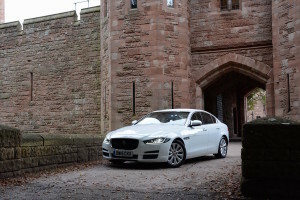 One of the strengths of the Jaguar XE is its driving experience. It does an excellent job of combining a comfortable ride with agile handling, and this is all complemented by sharp steering. 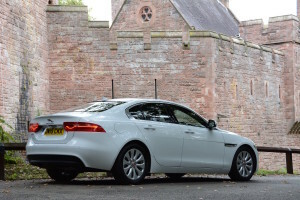 One of the XE’s selling points is its lightweight aluminium chassis, and the car does feel light to drive – although ultimately the XE is not that much lighter than an equivalent 3 Series. So the XE is a car that you’ll enjoy on a cross-country drive. However it’s also excellent on a motorway, when it’s comfortable and quiet at 70mph. Acceleration is another matter – this engine doesn’t endow the car with instant, thrusting acceleration, and when trying to carry out overtaking manoeuvres it can sound strained. One area that we think needs a bit more work is the response of the car from standstill. If you’re waiting to pull out of a junction into busy traffic and you spot a gap, you’ll hit the accelerator and it feels like there’s a huge delay before anything happens. More instant response would feel more reassuring. Yet when the power and torque do arrive, it’s possible to induce some rear end slip on a wet road. The XE carries over the rotary transmission selector from other JLR models. It’s a stylish thing, but if you’re in the middle of the road in Sport and trying to select Reverse in the face of oncoming traffic, again, it’s not the quickest of systems. Rivals’ gear selectors, where it’s one pull back for Drive and one push forward for reverse, are faster. 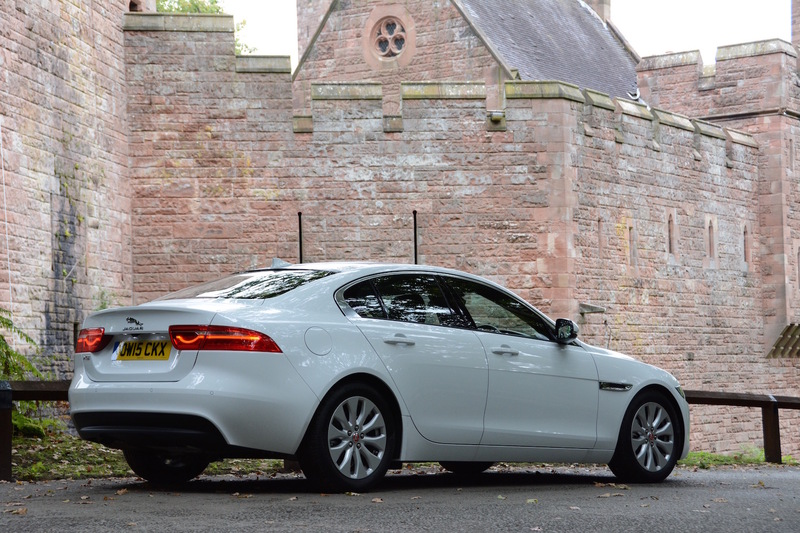 As well as Eco, Normal and Dynamic modes, the XE also has a useful setting for winter weather. 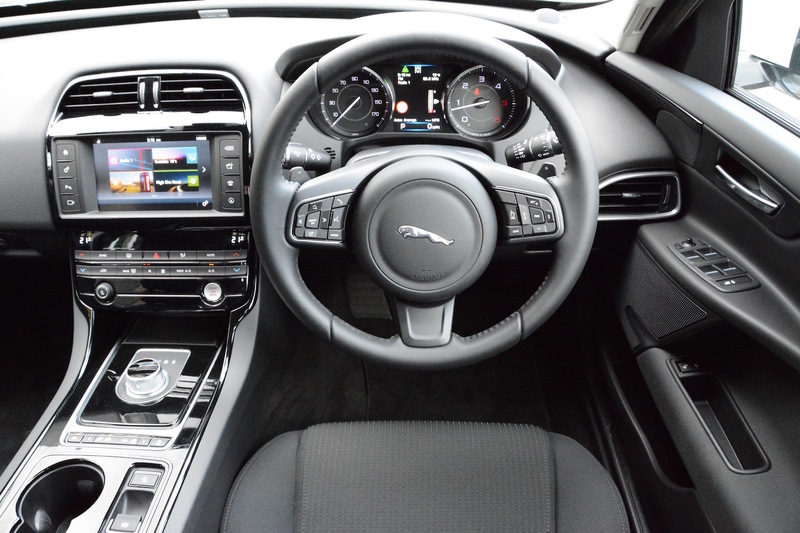 The XE’s infotainment system is based around a touchscreen. Regular Green Car Guide readers may be aware of our view that touchscreens aren’t the best way to control a vehicle’s systems when on the move. You also have to keep pressing the temperature control button repeatedly to change the temperature by half a degree each time; in our view a good old fashioned rotary dial that you can spin round quickly is a better solution. The official combined economy figure for the Jaguar XE SE 2.0 i4 163PS is 68.9mpg, along with emissions of 106g/km. It will come as no surprise that we didn’t achieve this economy in real life, but our average was further away from this figure than we expected. Although we managed 55mpg at motorways speeds, mixed driving resulted in 45.2mpg, and overall after a week we averaged 50.3mpg. Perhaps the engine needed more miles to loosen up. The manual XE model has emissions of just 99g/km CO2 (and 17% BIK). 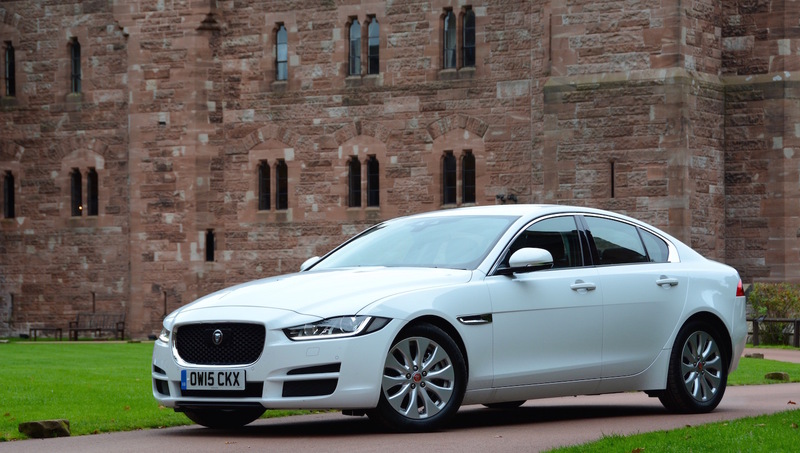 The Jaguar XE SE 2.0 i4 163PS costs £31,525. Our car had the following options: Polaris White exterior paint (no cost); Jet/Jet fabric (no cost); 17-inch Aerodynamic alloys (no cost); Power Convenience Pack (£900); 10×10 way Electric Front Seats (£765); Adaptive Speed Control with Queue Assist (£1500); Gloss black grille (£381); Lighting Pack (£1175); Split Fold Rear Seat – 40:20:40 (£400); Parking Pack (£530). This took the total price including options to £35,676. As well as this 163PS diesel XE, there’s a 180PS diesel. You can also opt for petrol engines: a 200PS, a 240PS, or a 340PS 3-litre V6. 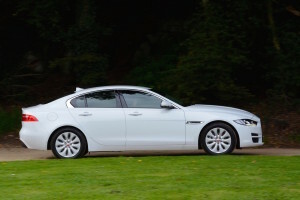 Unlike a 3 Series, with lots of variations, the XE only comes in a saloon body style at this time. 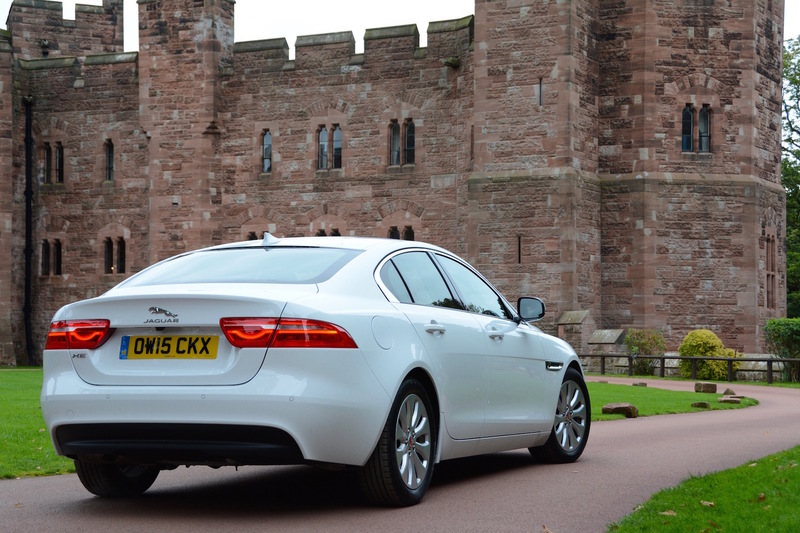 The Jaguar XE is a car that you want to like. It has a great badge, and a badge that’s more individual than that of a BMW. It looks good, although it looks even better with the larger alloys that most people are likely to specify. It drives well, both on the motorway – where it may spend much of its time – and on A and B Roads, where it offers 3 Series-rivalling fun. It would be great if JLR could sort out the delay in response when accelerating from standstill, and the real-life economy was somewhat disappointing. However as an overall package, the XE is likely to be worrying BMW, but perhaps more importantly, it’s offering car buyers a much overdue alternative choice in this class. 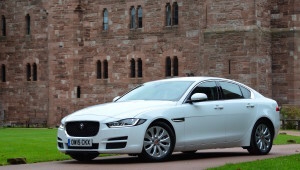 The Jaguar XE gains a Green Car Guide rating of 9 out of 10.